traditional Finnish weddings. Let’s start with Traditional British weddings. There used to be three different society parts in UK. These are royal family, the House of Commons and public society. In UK, British, Scottish and Irish people have different wedding traditions. In UK, on 1995 the laws changed and now everybody can get married in everywhere they want. Before, they could only have weddings either in the church or in official government buildings. Nowadays wedding couples have the freedom to get married everywhere for example on ship, in their houses, in castles, hotels and restaurants. In short, they can get married everywhere where registrar can come. There are even people who got married underwater. Couples can get married after they become 18. However, they can get married with their families’ permissions when they are 16 years old also. There are two different types of marriage and two different marriage certificates in UK. One is ‘’License’’ and the other one is ‘’certificate’’. License is for couples who want to get married as soon as possible without any celebration or ceremony. For license, you should bring your official documents to the government office one day before the marriage and you should pay the fee. There is a must to have two witnesses at the marriage. Wedding ring is not a must. So license means surprise wedding. To get married with certificate is a way for couples who want to have a celebration but not a church wedding. There are guests at the marriage ceremony. To get married with certificate, it is a must to bring birth papers of bride and groom and they also should pay the fee. After the application, minimum 21 and maximum 3 months later your marriage can be held. If you are planning to get married on a Sunday, you should reserve much more before since this day is always busy. If you are planning to get married with a church wedding, you should have your official marriage before or after the wedding. When we check old wedding traditions in UK we see 3 different types of weddings. Royal wedding; royal family determines how a royal wedding should be. Even if the groom or bride is from public, all the costs of the wedding must be paid by royal family. This kind of wedding’s preparation last sometimes for years. After the couple likes each other, flirting period can last 2 years maximum. Afterwards couples give their promise to each other to get married. After wedding preparations are finished couples come to church from their palaces with a horse carriage proper to traditions. After the ceremony in the church couples go back to their palace and determine where they will live afterwards. House of Commons means mostly business men, company owners, bank owners etc. Not every business man can be in house of commons. These people can only get married with someone who is also in house of commons. These kind of weddings are usually made for making a company greater or earn more money but sometimes of course they get married because of love. House of Commons’ weddings are usually colorful and gorgeous. Since they like to show off they usually choose destination weddings, hotel weddings or ballroom weddings. Engagement period lasts maximum 6 months. Public Marriage has no rules. Man and woman like each other, starts to see each other, meet with their families and then decide to get married. Families of the couples usually want to help for the wedding costs but if young couples do not want any help, they stand back. The couple who decides to get married chooses the place they will live themselves. Ringing a bell in the church is a tradition for everyone. This is for protection from the bad souls. When couple get out of the church guests throw flowers to them. This means good wishes for the couple. In UK, on 1995 the laws changed and now everybody can get married in everywhere they want. Before, they could only have weddings either in the church or in official government buildings. Nowadays wedding couples have the freedom to get married everywhere for example on ship, in their houses, in castles, hotels and restaurants. In short, they can get married everywhere where registrar can come. There are even people who got married underwater. Couples can get married after they become 18. However, they can get married with their families’ permissions when they are 16 years old also. These rules are also applied in Ireland. In Scotland, bride sits between the elder ones of her family and makes them wash her feet one day before wedding. This tradition symbolizes the couple’s long marriage walk with happiness. On wedding day, bride should put 2 coins in her shoes to symbolize fertility. In addition, when we look at Viking history, we can see that weddings are made as auctions. Groom candidate offers bride candidate’s father some money, they bargain on the price and this money is used for dowry. Moreover bride’s mother puts a golden coin in left shoe and father of the bride puts silver coin to her right shoe for fertility. In 1995, with the amendment of the law that the marriage ceremony in the UK can only take place in the church or in the marriage hall, couples gain the freedom to marry in every place they request. They could get married on yacht, at home, in castles, in hotels and in restaurant. In short, they could get married wherever the registrar agrees to come. Today there are people who marry even under water. To be able to marry, the bride and groom must be at least 18 years old. However, with the permission of their parents they can also marry when they are 16 years old. In Scotland, the bride is sitting in the middle of the family's elders the night before the wedding, and they wash the bride’s feet. This tradition symbolizes the walk of the couple on their way to happiness. At the wedding, the bride put coins on both shoes. On the other hand, during Vikings' time, marriages were in auction type. The groom candidate was offering bride’s father a price for the bride-to-be, negotiating on this price, and the amount of money determined was used for the dowry. In addition, during the marriage of the couple, bride’s father put silver on her right foot and bride’s mother put gold on her left foot for to avoid lack of gold and silver troubles in marriage life. One of the most important traditions in Belgium is to embroider names on napkins. The family of the bride brings the napkin which has her daughter’s name on and shows the wedding guests. Brides from Finland wear a handmade golden crown on their wedding day. After the wedding ceremony, all the single girls gather around the bride and bride gives her golden crown to someone she chooses. It is believed that the chosen girl is going to get married soon. The wedding guests bring the flowers which will be used for wedding venue decoration during wedding ceremony. It is also a very known tradition in France that the couple should drink wine from the marriage pot which comes from generation to generation. Wedding City Antalya is an international wedding operator. We can organize your traditional British wedding, Scottish wedding, Irish wedding, Indian wedding, Pakistani wedding and Iranian wedding. We respect your traditions and your culture. Please visit our web page or call us for further information. You may see our wedding packages, wedding partner hotels and some weddings we organized from our web page. 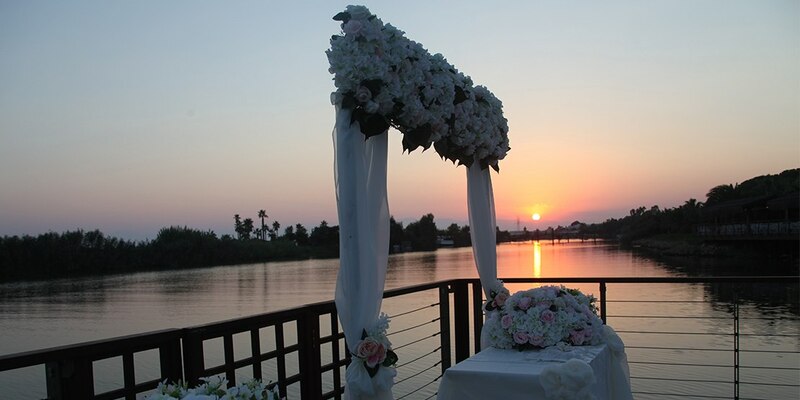 If you want your perfect dream wedding in Antalya, you are at the right place. We are the best wedding planner company in Antalya.